Peace and Independence – Can we have Both? 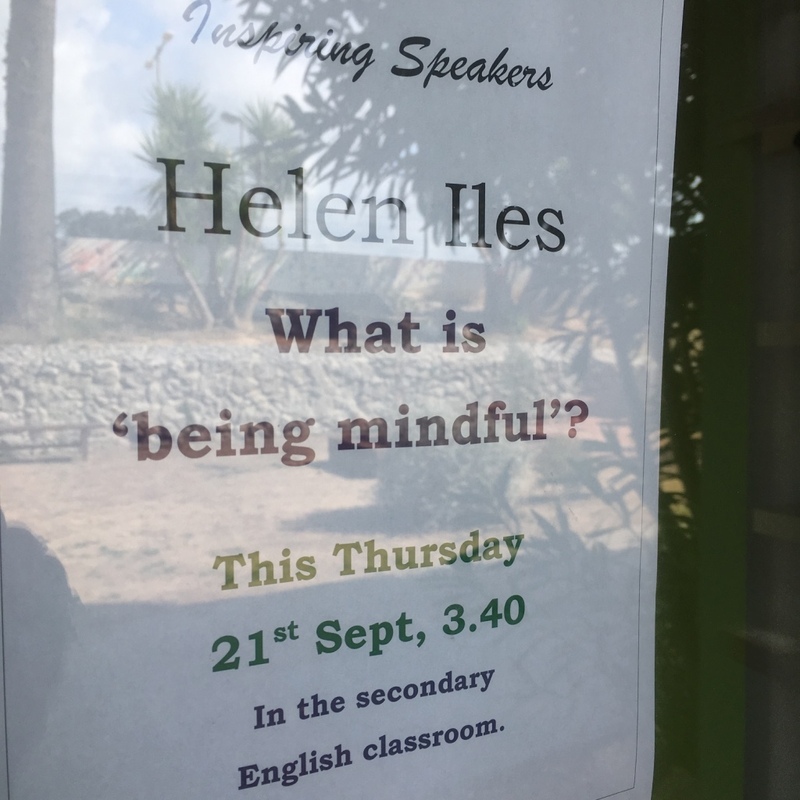 On Thursday this week, the International Day of Peace, I gave a talk at a local school about how the practice of mindfulness relates to peace. Drawing on the idea that without inner peace there can be no outer peace, I outlined how our personal practice can help facilitate calm, clear communication with others, even if they have harmed us. I was careful to tell the young people that there are times we need to stand up for ourselves, call another out for their wrongdoing, but suggested that it could be done non-violently. On Friday, sitting with friends in a flat in Barcelona, a clattering begins outside. It’s 10pm and the casolada has begun. From all around, we can hear the dull chiming of spoons on pots. This is a people’s protest, Catalan style. I stand on the balcony and look out over the darkened city. To my left, I can see the tallest towers of the Sagrada Familia, where we have just spent a pleasant hour in one of their free public openings. It was my first visit, though I have been living in Catalonia for over 18 months now. Gaudi’s masterpiece cathedral is astounding, but to be honest, I am much more excited by the casolada! My friends have heard it before. They live in the city and have been present during the last few days of protest, but I live out in the countryside and though I have heard stories, this is my first contact with the indignation currently sounding throughout Barcelona’s streets and homes. Catalonia is preparing for their October 1st referendum. 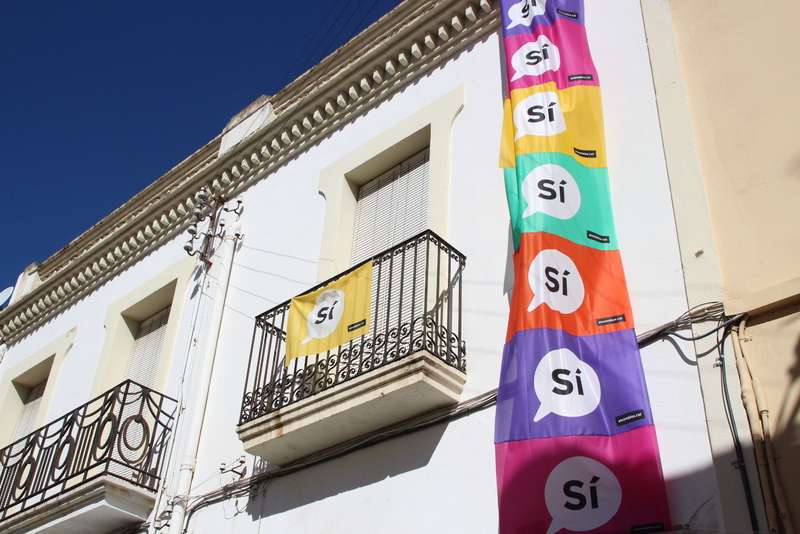 They will vote to decide whether to split from Spain and claim independence. This is not news. 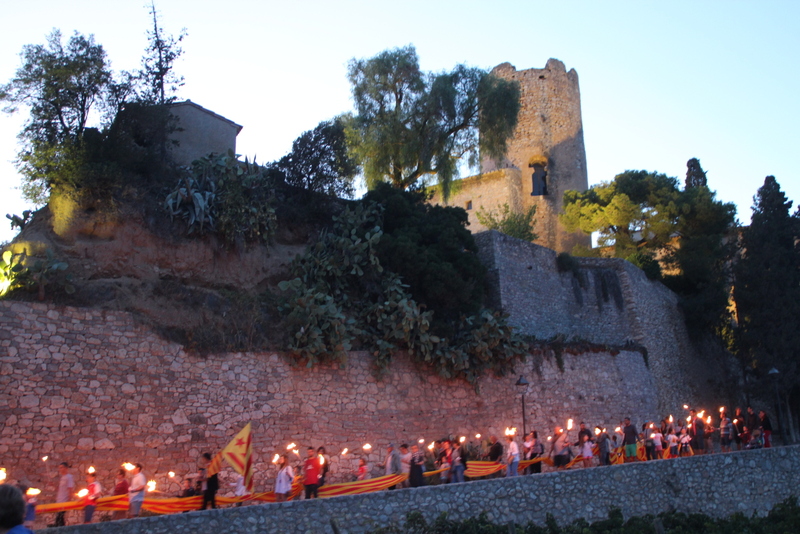 The banners proclaiming “Sí!” hang from balconies in every town and on the recent Díada of September 11th – Catalonia’s National Day – a torchlit march in my local village saw people wearing the Señera – the national flag – like capes and carrying a thirty foot long version of it through the streets. This year, it was hard to separate national pride from the question of independence. Life in Catalonia, though relaxed and relatively easy, is always infused with contradiction. The Catalan language is spoken everywhere, in schools, in shops, in the street, at home. Because everyone knows it is a language that has fought for survival, the very speaking of it is an everyday political statement. As a Welsh person who grew up learning, but not speaking Welsh, I have nothing but respect for the way this language has been fiercely protected. It is a mark of identity and solidarity, but not, funnily enough, exclusivity. Catalan people meet the stumbling Spanish of tourists with grace and kindness, though, like the Welsh who insist they are not English, the Catalans are defiantly not Spanish. As Britain prepares to redefine itself as separate from Europe and the Scots back away from declaring their own independence, I feel ambiguous about separatism and nationalism. Cultural identity is important. It helps us feel we belong somewhere and reinforces a sense of community. However I still feel that these arbitrary frontiers, drawn along lines which tell tales of war and conflict, seem at best like childish spats over yours and mine and at worst, deadly symbols of division. How can we have both? How can we express ourselves and our feelings of home and country without making our neighbours the enemy? This is a question, surely, that we all must answer every day, in each encounter, in every single human relationship. After all, peace begins with me.